It is not easy to transfer music from PC to iPhone unless you know the tricks or ways. However, there would be some ways better than others. Though there may be some limitations of using iTunes to make it, but as a traditional way, it deserves to try. Of course, you can also follow the new way without iTunes to transfer music from PC to iPhone. iTunes is the apple verified user compatibles portal which helps you transfer files in between two devices. This user interface can be utilized to transfer songs from PC to iPhone. Launch iTunes on computer and link your iPhone. Make sure you are in the “Music Library”. Go to “File > Add File to Library”. Choose where you locate the songs and select them to import. Click device tab at the top left corner. Tap “Music” tab at the left menu. Check “Sync Music”. You can choose to sync the entire music library or some selected ones. Hit “Apply” button at the bottom right corner to finish it. 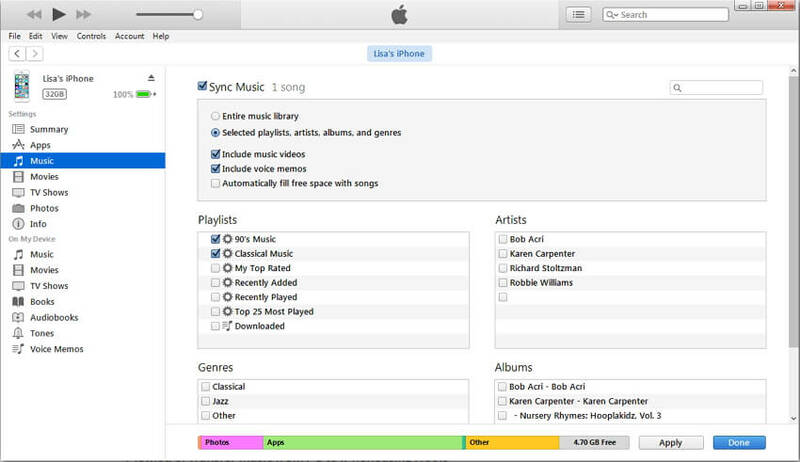 All the existing songs on your iPhone will be replaced with the synced songs. iTunes has restricted itself to media files with specific formats. Your iPhone can be synced with only one iTunes library at a time. If you already made it on other computer and want to transfer music from this PC to iPhone, you will lose everything on your iPhone. If you accidently delete a purchased file/song on iTunes, the only way to redeem it is by purchasing it again. With the help of iTunes you can transfer files to and fro your computer. The downside to this is that Apple only allows 5 computers to be authorized to a single device. It is evident that iTunes might need some improvement when it comes to being a potent medium between computer and iDevice. Other alternatives and software applications have flourished overcoming what iTunes lacks. iMyFone TunesMate is an application that has made life easy when transferring music from PC to iPhone. You do not require iTunes in order to transform your iDevice as a receiver to transfer essential files. You can selectively choose files before transferring with the help of this easy-to-use software. Not only is this ideal choice when it concerns transferring music from PC to iPhone; you can also transfer files from your iDevice to your computer. You can take this opportunity to transfer files from Music, iTunes U, Audiobooks, Podcasts, etc. So how to copy music from PC to iPhone? Step 1: Launch the iMyFone TunesMate on your PC and connect your iPhone. Step 2: Next, click on the “Music” icon present on the software window. Step 3: Click on the “Add > Add File/Folder” option. 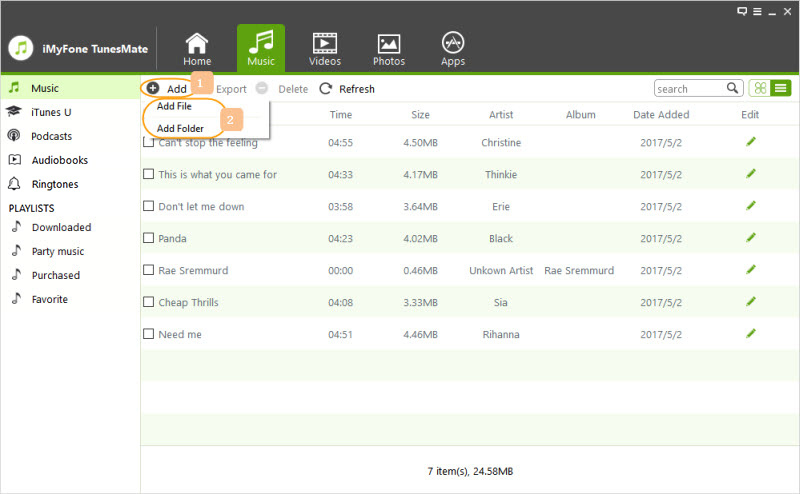 Now you can choose the location of your music file/s on your PC and hit “Open” to import songs you wish to transfer. What Benefits You by Using TunesMate to Transfer Music? In comparison to iTunes, iMyFone TunesMate has outdone itself. It will not delete the existing music on your iPhone when transferring. You can transfer music from this PC to iPhone without deleting even when it is synced to another iTunes library. You can selectively transfer music instead of all music. It does not require you to launch iTunes. You don’t need to transfer music from computer to iTunes in advance. It allows you to transfer music with different music file formats. iMyFone TunesMate can transfer files from your iTunes library to your iDevice. It is also capable of being a sufficient medium for transferring songs on your iDevice to your iTunes library. You can manage and organize your playlist and songs using TunesMate. You can skillfully delete or remove files from your iDevice using this software.